I received the above promotion for the All New Lexus GX in my email last night. It shows a Victoria Beckham / Grace Jones Super Woman who is identified as "The Driver: Trusted transporter of precious goods." It's raw girl power aged 20 years to fit the middle-aged target consumer. It's tough, stylish and strong. Sure it's a bit funny coming from what most people consider the boring Luxury brand that builds quality vehicles, but this is marketing to the edgy luxury consumer and another example of luxury female focused marketing, similar to the recent BMW 5-Series GT. 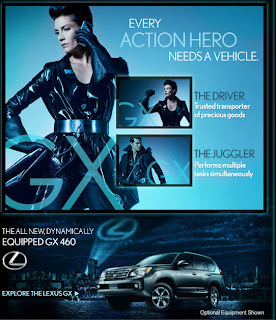 Unlike the 5-Series GT marketing where the email marketing leads the interested to a site matching the email creative, Lexus brings the consumer to a brochure-ware site experience that leaves out all of the girl power messaging. Instead the consumer is showed a product demonstration overview video and provided several links to learn more about the car. Pretty stale stuff after the rock star promise. So what happened to Victoria Beckham / Grace Jones Super Woman? She's gone and so is all of the "transporter of precious goods" messaging designed to appeal to the target consumer. What a shame because there was so much scrumptious fun that could have been if Lexus continued through with its creative idea.